Health care stole the American dream. But it's absolutely possible to take it back. An excerpt from the CEO’s Guide to Restoring the American Dream: How to deliver world class healthcare to your employees at half the cost. I often think about a question that should make us all step back a bit. Why are millennials—the largest American generation in history—the first generation to think life won’t be better for them than their parents? In a nation of optimists, this is worrisome at best. I’ve come to realize that the cost of health care is a primary underlying cause of their worry. Over half of their lifetime earnings are on track to go to health care. As they have children and their indestructibility fades, millennials are realizing that they’re going to be indentured servants to the health care system if nothing changes. This is profoundly sobering, but the good news is we’ve solved tougher problems and this one has already been solved in microcosms around the country. I’ve come to believe that employers and physicians are natural allies once they are awakened. The same forces at the root of physician burnout—insurance companies and hospital administrators—also often have objectives diametrically opposed to employers. No doubt, you’ve seen the graphic below. My point is that removing administration and middlemen who add limited value is in the shared interests of both employers and medical practices. It’s one of the easiest things for employers and physicians to collaborate on. We call this a Transparent Medical Market in the Health Rosetta—the LEED-like blueprint for smart health benefits purchasing that employers are increasingly adopting. If I only accomplished one thing with this book, it would be to create hope in the simple, practical, proven fixes that improve the lives of patients and physicians alike. 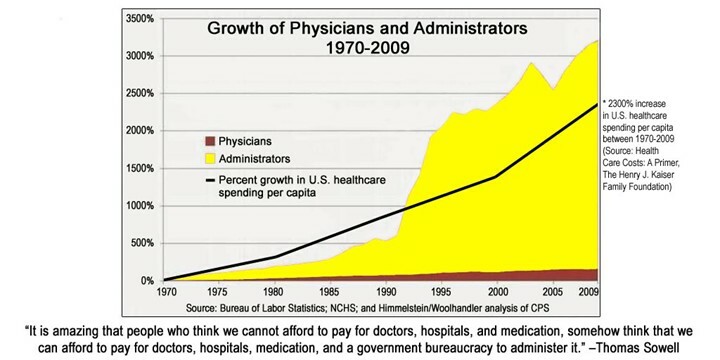 As Dan Munro likes to say, “the [health care] system was never broken, it was designed this way.” The best way to describe the status quo payment system is a Gordian Knot designed by Rube Goldberg that creates an excruciating situation for physicians and patients alike. Brain surgery is complex. Cancer is complex. Building a high performing health benefits plan and paying for high-quality care doesn’t need to be. If I haven’t already been clear, true fixes to our health care mess aren’t coming from DC. As I write this, the latest attempt at “reform” by Congress is yet another example of rearranging deck chairs on the healthcare Titanic. Hundreds of thousands of regular citizens, clinicians, CEOs, and union leaders are restoring the American Dream one community and company at a time. They’re stepping up in grassroots groups and working together to solve the crisis. This is what America does. When it comes to big societal problems like civil rights, better food, or energy independence—we’re best at solving these problems from the bottom up. The goal of this book and the Health Rosetta Institute is to make it possible to recreate the successes in your own community and across America. Let’s get started. In short, it became something I couldn’t not do after seeing dozens of organizations that have reduced their spending by 20 percent or more while saving their employees from losing their health and facing financial ruin. Their strategies also improve life and often compensation for doctors as well. These same results are possible for nearly any purchaser that has the will and access to the right expertise. This can go into an employee’s pocket, business, and community, restoring the American Dream in the process. Successes are sprouting up all over the country, from small manufacturers to school districts to large municipalities to Fortune 100 companies. If every employer adopts these common sense steps, we’ll create a $500B citizen-driven economic stimulus every year while dramatically improving the lives of countless citizens and doctors. One of the most exciting developments is medical practices (as employers themselves) creating captive insurance programs that free themselves from the yolk of under-performing traditional health insurance programs. However, there are $3 trillion reasons to protect health care’s status quo. To stop progress, there’s nothing easier to politicize, confuse, and frighten people with than health care. It’s life and death, right? Those looking to protect the under-performing status quo will try to politicize health care and use fear, uncertainty and doubt to protect their interests. However, let’s be clear about the stakes. Data from Rand, Brookings and other reputable sources have shown that hyperinflating health care costs have been 95 percent responsible for 20 years of income stagnation and decline for both the middle class and our most vulnerable citizens. This has profoundly and negatively impacted nearly every single American. It’s a national shame that we can reverse. No industry spends anywhere near what health care does on marketing and lobbying at the local, state and federal levels. Each of us must inoculate ourselves against status quo enablers who benefit—at the cost of our health and our wealth—when they infect us with the sense that health care is too complex to fix. This is simply false and the Health Rosetta shows how and why. Hundreds have been coming together to create this free, open source blueprint that uses real life successes to show how health care isn’t too complex to fix. For each major Health Rosetta component, it shows how it works, why it is better than the status quo, what challenges to expect, steps to take action, and links to more resources. We’re just getting started with where we’re taking it, but people and organizations representing millions of Americans are already jumping on board. Americans are no longer waiting for solutions from somewhere else. We’re looking in the mirror and realizing it’s on us to restore the American Dream. The fixes even transcend the typical lines that divide us. The common thread in each success is that the people involved shifted their mindset, realizing that we don’t need left-or-right, management-or-labor solutions. We need an American solution and the good news is it’s spreading like wildfire. For too long, we’ve let health care crush the American Dream. We won’t survive 20 more years of a middle class economic depression. No country has smarter or more compassionate nurses and doctors. No country has more innovators that have reinvented our country time and again. Nearly every individual in health care went into it for the right reasons, but perverse incentives and outdated approaches have left them shackled or downtrodden. Whether we knew it or not, we all contributed to this mess. Now, it’s on all of us to fix it. When change happens community by community, it’s impossible to stop. Yes, health care stole the American Dream. But it’s absolutely possible to take it back. Join us to make it happen in your community. 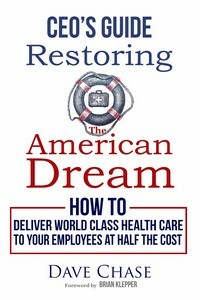 Dave Chase is creator, Health Rosetta and author of the CEO’s Guide to Restoring the American Dream: How to deliver world class healthcare to your employees at half the cost.